Yew House Bed & Breakfast01892 610522work Guest AccommodationYew House is a detached property offering a flexible range of bed and breakfast accommodation. Yew House has been built with as many green and Eco friendly features as possible, low wattage lighting circuits, water efficient devices, central heating with individual thermostats on all radiators, Heat reflective windows, a very high degree of insulation. All the electrical plugs sockets and switches are set so as little or no bending is required. A personal welcome awaits all my guests whether for a one night stay, through to the business person who may need a month or more. 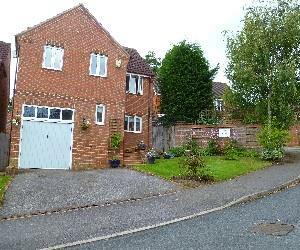 Are you coming to Crowborough, Rotherfield, Uckfield, Tunbridge Wells, Lewes or surrounding area for a wedding, christening, house hunting or a job interview, visiting a friend or relative at the Hoarder Centre or at one of the many private nursing homes and hospitals in the area; or just wanting a place to relax to for a weekend away with a quiet walk on the Ashdown Forest? Then please contact me for availability. Warm welcome award. Electronic brochure downloadable from our own website. Yew House is a detached property offering a flexible range of bed and breakfast accommodation. Yew House has been built with as many green and Eco friendly features as possible, low wattage lighting circuits, water efficient devices, central heating with individual thermostats on all radiators, Heat reflective windows, a very high degree of insulation. All the electrical plugs sockets and switches are set so as little or no bending is required. On A26 from Tunbridge Wells to Brighton turn left at Crowbrough Cross traffic lights over mini roundabout. Pass Police Station on left. The road drops down hill. Yew House is on left before the Medway turning (Yew House lies back off road). From Brighton turn right at Crowborough Traffic Lights, then as above.